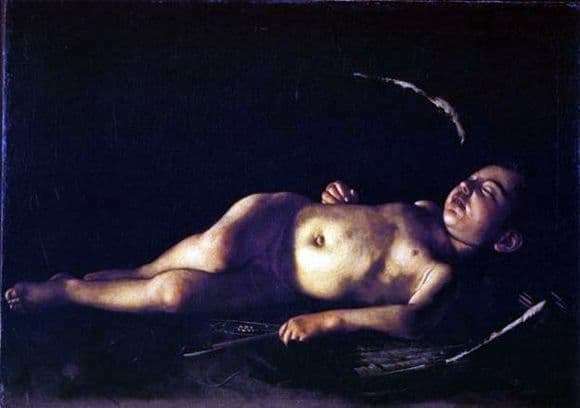 In the days when Caravaggio began to write this picture, most people firmly believed that the very immersion in sleep can serve as a symbol of liberation from such qualities as sensuality. Knights aspired to him, who in their time gave a vow of celibacy and chastity. The cupid in the picture, too, is immersed in a deep and peaceful sleep, his posture is completely relaxed, and his dreams certainly do not disturb him. The boy’s right hand is free on his stomach, and in his left hand he is still squeezing his bow and arrows. His weapon is able to hit the disease of love anyone who dares to wake him. His dark wings spread out: right away from his master, and he put his hand on the left wing. The feathers in the wings are large and smooth. Cupid is completely naked, but it does not bother him at all, everything in his pose speaks of naturalness. One leg lies on the other, he stretched them along the entire canvas. Peace and happy sleep, no one interrupts him. Around him is a dark background, in which nothing is visible except the character’s body. After studying this picture in research laboratories, it became known that earlier the picture depicted birds, as a symbol of mutual love, and other small objects. But later the author closed everything with a dark background. The features of the Amur face are large and the hair is short. He looks like a little child, tired after a long and tiring day. With a long look, his dream seems too deep, like a stupor. Severe, oppressive sleep can serve as a symbol of the inexorability of such a transient phenomenon as time.